A biography of Heinrich Himmler, head of the SS Gestapo, concentration and extermination camps who oversaw for Hitler the programme of genocide of the Jews euphemsed as the 'f9inal solution'. "Padfield writes clearly, and, judging from Himmler's reference notes and bibliography, it is apparent that his research is thorough and his knowledge of his subject encyclopedic. 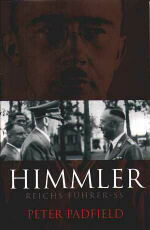 The reader can be assured that this book contains all the facts that he could possibly want to know about Himmler, who was one of the four or five most powerful men in the Third Reich..."
"Peter Padfield's book on Heinrich Himmler is the first solid and readable account of Heinrich Himmler's place and purpose as the most destructive of the Nazi leaders. It is a fine piece of historical work." "It can be no easy job writing the life of a monster like Himmler...Mr Padfield has convincingly sifted the evidence while steering clear of the pitfalls. His is a black biography, as black as the uniforms of Himmler's praetorian guard, the SS..."
"...Padfield is a writer of great power. 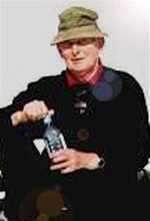 The scenes he paints of what the SS did in its 'police' role, and in the camps, where it reflected most clearly the effect of unfettering Himmler's mish-mash of café Stammtisch racialism, half-educated conspiratorialism, thwarted sexuality, locker-room machismo and wagon-lit philosophy, are as graphic and horrible as our imaginations can grasp, a hell on earth more terrible than any medieval artist or Calvinist theologian could depict." "For this massive biography Peter Padfield has painstakingly documented all that we need to know about the architect and overlord of the Nazi empire of terror. It is not, as Padfield readily admits, a work of original scholarship. There are no interviews with Himmler's surviving intimates, and no startling new facts are unearthed. Nevertheless, Padfield has methodically read through a mass of material, organised the salient details and told the story with just the right historical objectivity, leavened with an understandable revulsion for his subject." "At the end of the week it took me to read Peter Padfield's life of this unlikely mass murderer I found myself reaching for the mouthwash. I shudder to think how Padfield himself must have felt after reputedly spending five years of his life peering into Himmler's diaries, letters, speeches and file notes, but the result, the first full-scale biography of the Reichsführer-SS, as well as being, I think, the most accurate life of any of the Nazi leaders, is also the most chilling portrait of evil that I have ever read."